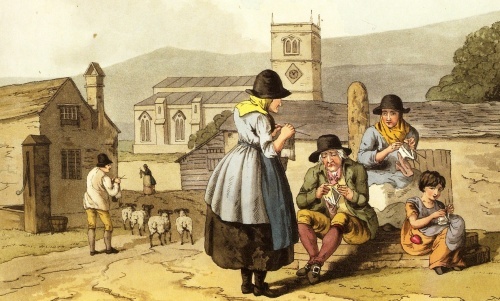 The women, men and children of some communities all knitted whenever they could, as seen in The Costume of Yorkshire by George Walker, 1814. As winter drags on, we look at the history of hand-knitted clothes. An ancient, widely-practised craft, knitting is the creation of fabric from a single thread formed into horizontal rows of loops that interlock with each subsequent row. Historically, the natural yarns available were linen, hemp, wool and later cotton, although wool was often favoured for its softness and warmth. For centuries, wooden sticks, bone, ivory or quills were the basic hand-tools used, until fine steel needles became more commonplace in the 1800s. Over time, diverse customs evolved in different areas, regional variations giving the knitting of specific locations a strong visual identity; yet the familiar knit and purl loop construction was almost universal and similar knitted textiles have been produced worldwide for centuries. Surviving pieces from 2nd-3rd century Egypt and Syria suggest that early knitwear served to protect the extremities: warm coverings for the head, hands and feet. By the Middle Ages a high level of expertise had been attained, with luxury articles owned by royalty and aristocracy, and locally hand-spun coarse wools probably knitted at home into everyday garments. The woollen industry was at the heart of Britain’s medieval economy and following the development of the spinning wheel, which enabled the production of finer yarns and greater quantities, from the 1400s hand-knitting advanced significantly, both at a domestic and a professional, commercial level. In 16th century England knitted woollen caps were widely worn by men and boys, often dyed red using madder, or black. The skilled construction of Tudor caps, centring on a flat circular crown, has scarcely changed and knitted caps and hats have been in and out of fashion ever since. Also in the 1500s, when finer needles first appeared, knitted stockings began to replace traditional woven cloth hose, launching what would become a vast and successful hosiery industry. Elizabethan and Jacobean courtiers favoured exquisite silk knitted stockings embellished with coloured silk and metallic embroidery and during the 1640s striking wide-topped woollen ‘boot hose’, worn as an extra layer inside cavalier boots, became a dashing fashion statement. T-shaped fine knitted cotton and silk body garments were also an elite mode, as exemplified by the knitted silk ‘shirt’ reputedly worn by King Charles I at his execution in 1649. Among the wider population, in the pre-industrial age hand-knitting provided practical garments for the family and also gave inhabitants of poor farming and fishing communities a way of earning much-needed extra income, especially during the winter. Being light work carried out with basic portable implements, men, women and children knitted whenever possible, for instance while watching over sheep, walking to market or sailing boats. They often used a knitting sheath tied around the waist or tucked in the apron or belt – typically a stick with a hole or groove to hold one needle in place, freeing one hand and also steadying and hastening the work. Among Britain’s many knitting centres, the isolated Shetland Islands were important from the early-1600s, where the knitting of caps, jerseys, gloves, stockings and underwear to trade for money or essential goods was a livelihood for the whole community. From the late-1800s one of the islands, Fair Isle, became internationally-famed for its intricate knitting comprising horizontal bands of small repeating geometric motifs in several colours – distinctive designs reputedly first brought by sailors wrecked in the Spanish Armada. 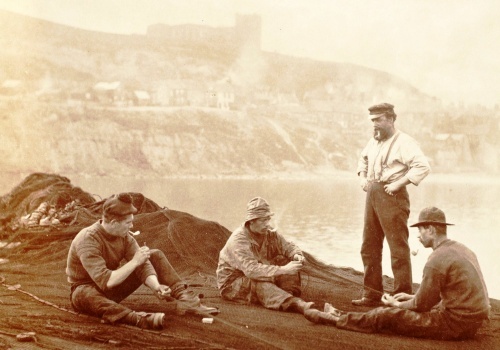 Knitting has long been associated with the sea, most notably the blue or grey fishermen’s knitted Guernsey sweater or ‘gansey.’ Originating in the late-1700s in the Channel Islands, this hard-wearing garment was widely worn by fishermen throughout the 19th and 20th centuries. Mainly knitted from four- or five-ply worsted wool, ganseys were essentially T-shaped, with under-arm gussets and side slits for easy movement, but also had a tight neck, welt and cuffs to keep out freezing winds. The hard twist given to the wool during spinning and the tightly-knitted stitches, coupled with the wool’s natural oils, ensured that ganseys were warm, windproof and offered some protection against rain and sea spray. The classic Guernsey pattern was plain, although often designs were knitted across the chest, upper back and the upper sleeves. Local fishing communities developed their own complex patterns, unique to their region and often passed down the generations. Theoretically it was possible to identify the village or even the family of a drowned sailor, from his gansey. Knitted sweaters, stretchy and comfortable, began to be worn by Victorian sportsmen and from the early-1900s, along with cardigans for women, were increasingly adopted for leisure activities like walking, ski-ing, golf and tennis. During the First World War, many women keeping the home fires burning hand-knitted cosy ‘comforts’ for the troops - socks, gloves, mufflers, body-warmers, jerseys and balaclavas. Equally, knitting was an economical way of extending the family’s wardrobe and many women also produced infants’ garments and relaxed knitted caps and jackets for themselves. After the war, hand-knitted garments entered everyday dress for all, especially in winter. Knitting patterns produced by companies like Weldon’s, Leach’s and Jaeger provided instructions for knitting everything from underclothes and baby outfits to schoolboys’ sweaters and sets of matching hats, mufflers and gloves, the introduction of various novelty yarns giving knitting a further boost between the wars. After war erupted again in 1939 hand-knitting became essential to the home front concept of ‘remaking and making do’, the Women’s Voluntary Services leading a nationwide knitting drive. When most materials were scarce, knitting wool proved invaluable and women knitting ‘comforts’ for the troops again also made items for their families, from any colour and quality of wool available. 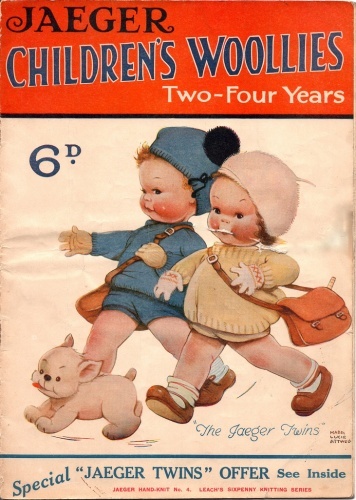 Spare wool was never discarded and adult garments were often unravelled and knitted into new children’s clothes. As a form of camaraderie women knitted in groups, even in air-raid shelters, or spent evenings at home darning and knitting, while listening to the radio. Once the years of post-war austerity had passed, homely hand-knitting began to seem old-fashioned: new designer-knitters of the 1970s and 1980s revived colourful knitwear, but domestic hand-knitting continued to decline. Yet in the 21st century as many of us now seek more meaningful social interaction and appreciate anew traditional skills and crafts, hand-knitting is becoming again a satisfying, creative experience, often a community activity and a cool trend. Knitting is part of our cultural heritage and we are picking up our needles again. 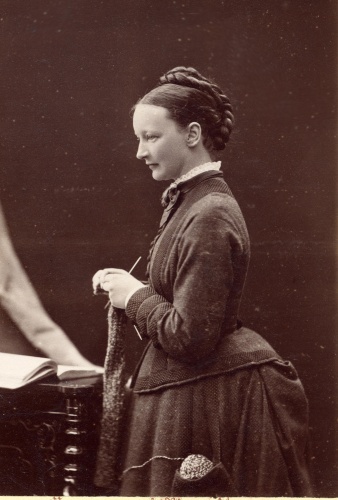 Needlecrafts were taught at school and in the Victorian home, some women even choosing to be photographed doing their knitting, as in this studio portrait, 1870s. Two fishermen in this scene, 1890, wear the iconic hand-knitted fisherman’s blue gansey, a warm, comfortable and durable garment. 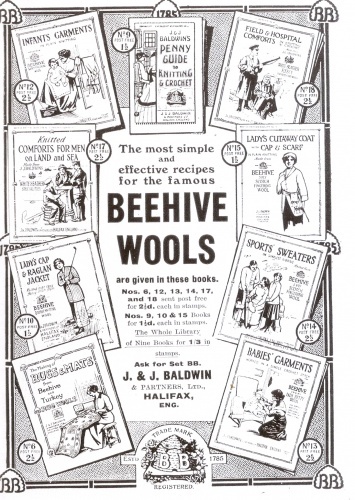 This Beehive Wools advert, 1915, shows the range of knitwear produced during WW1: comforts for the troops, economical civilian clothes and leisure/sportswear. 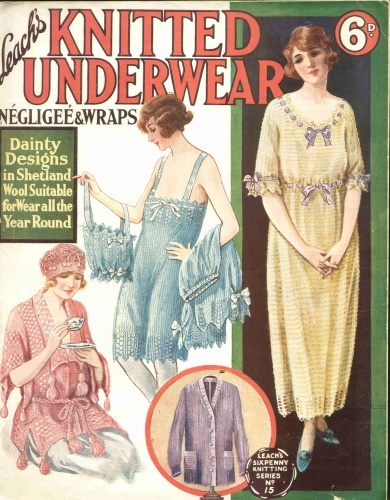 Knitwear grew very popular during the 1920s and there was little that could not be hand-knitted, as seen in this Leach’s pattern for ‘dainty’ underwear and nightwear. 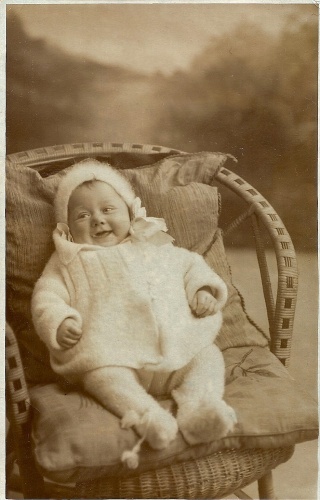 This jolly baby, photographed c.1930, models the latest fashion in hand-knitted novelty woollen pram sets comprising hat, matinée jacket and leggings. 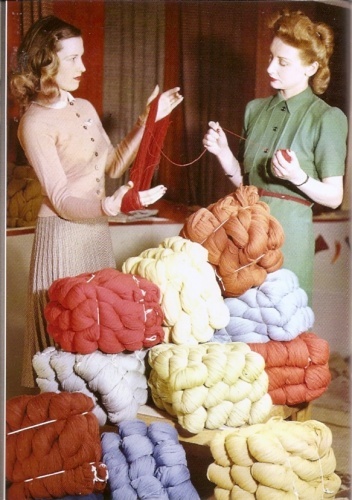 Knitting wool was a very useful material during WW2 and all kinds of garments were knitted, unravelled and re-made, no wool ever being wasted. 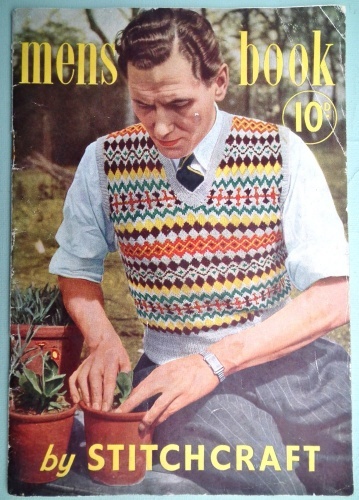 From about the 1930s it was common for men to wear a knitted sleeveless jersey or waistcoat over their shirt, the pattern often loosely based on the Fair Isle design. 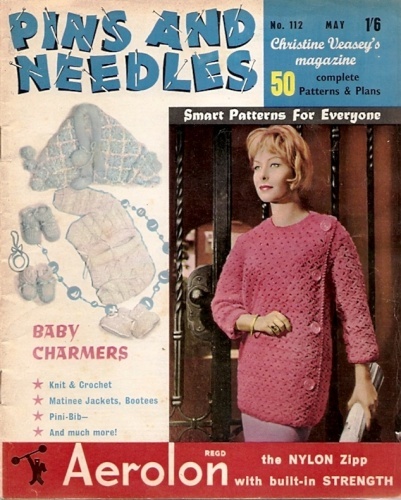 Pins and Needles magazine, 1962 shows a continuing interest in knitting, but the craft was increasingly considered old-fashioned and entering a period of decline.